Yesterday I was able to start weaving on my sampler. The workshop is going to explore five weave structures. Besides huck, we will learn huck lace, spot Bronson, Bronson lace, and Swedish lace. The five yard warp I have on the loom will give me an opportunity to learn and explore these. It will require some cutting and rethreading, but that will be better than dealing with separate warps for these! First on the list is huck. Huck is not technically a lace weave, but it will lead into huck lace, so it's a logical place to start. 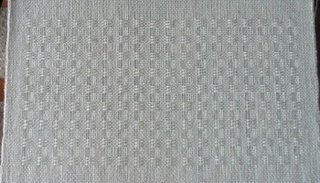 Also known as spot weave, it is actually a loom controlled textured weave which creates spots of either warp or weft floats. Harriet Tidball (The Weaver's Book) classifies it as a grouped thread or linen weave. It consists of short warp or weft floats on a plain weave background. 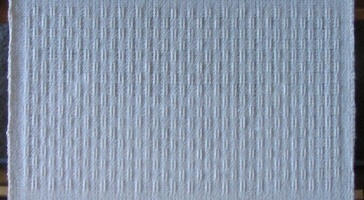 Warp and weft are the same or similar yarn. It requires a minimum of four shafts; two for the pattern blocks and two for the plain weave. The blocks are treadled the same number of times as there are warp ends. How and where the spots form depend on the treadling. The pictures are not exceptional. The flash washed the pattern out and natural light doesn't show it off that well either. We've been assured that is will look better once they are off the loom and washed. You can see how the different times of day effect the color. I admit that I can't help but wonder how color would effect these. But I'll save those experiments for later. For the moment, I'm content to follow the plan. I love weaving huck. It's one of my favorite weaves. I love that it weaves up quickly and it looks great in any color. Your samples all look terrific. I'm really looking forward to watching your progress on this workshop. As a relative newbie weaver, I'd like to try experimenting with lace weaves. Your samples look nice! I have duly noted the "almost"......... Why I like crackle so much is because you can manipulate structure for color effects. Seriously, though, your huck spots are very nice. I'm not sure, however, but that color effects wouldn't detract...........now have I just set up a challenge for you????? Gorgeous! I am not a weaver but these are beautiful. We used a huck lace pattern on the shawl we made for the sheep to shawl contest at the fair. In fact, it looks just like you're second example. Looking good! I've woven huck before and never knew that there was a difference between huck and huck lace. Interesting! Thanks for sharing. There is something compelling about the texture of these weaves.